One problem that sometimes happened was that starting online matches failed to properly initialise. One of the main problems turned out to be a double login where the server would send startup messages to the other device (say you were logged in on your PC and mobile at the same time). Now this is detected and you can log out the other device and startup should work fine. You can now sort the user list either alphabetically or on interest flag. [*]Magriel's challenge! Split your back checkers and hit in your homeboard. Is a tempo hit the key here? [*] Now with less ads! I have removed the ad dialog as it didn't seem to be showing any ads anymore. [*] Transcriber/Submitter now displayed in match info. 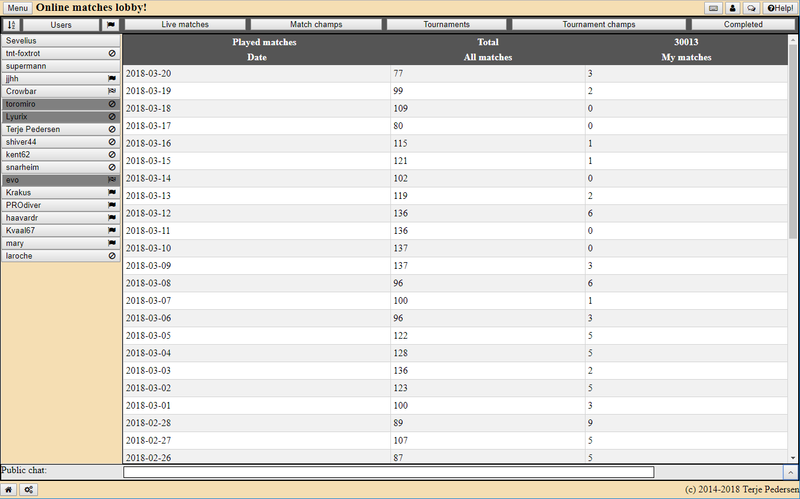 Data is missing/incomplete for a lot of matches though. Suggested by Mislav Kovacic. [*] You can now search for some text in filenames of uploaded matches in the match list. [*] Matches can now be tagged by different tags which can then be searched for in the match list. [*] Head 2 head information when clicking on the player info while playing an opponent. Suggested by Zoran. [*] Country flag displayed in player info. [*] You can open a Take/Drop dialog when clicking on the cube once you have been cubed. [*] Focus on correct info tab when content changes. [*] Sort users alphabetically and on interest in users lists (sorting isn't automatically refreshed for now). [*] You can message opponents to incomplete (or tournament) matches instead of just poking your opponents. [*] You can't have more than 5 incomplete matches to join tournaments. A good reason to clean up those incomplete matches! [*] When searching for a player in the matches list the list will be ordered on the player you search for. Suggested by Lars Trabolt. [*] Use a yellow star for premium users in menus instead of 'upgrade' (to avoid confusion). Suggested by gammongert. [*] You can now log in with your email address in the username field (common on other servers). Suggested by Karsten Bredahl. [*] You can now disable match emails after a match is completed. Suggested by Culpina. [*] You can now receive an email when an opponent for an incomplete match logs in. [*] The educational videos are ordered by date (latest first) by default. 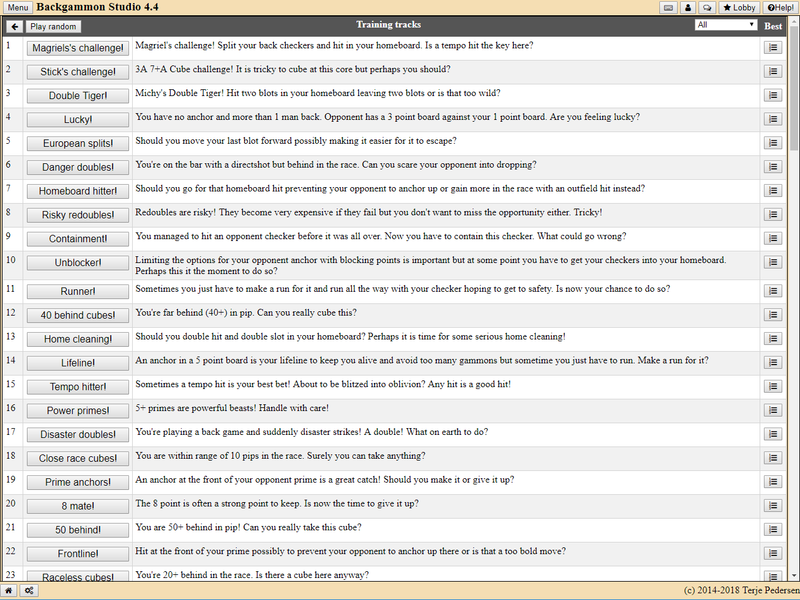 [*] List matches from a transcriber in match list. 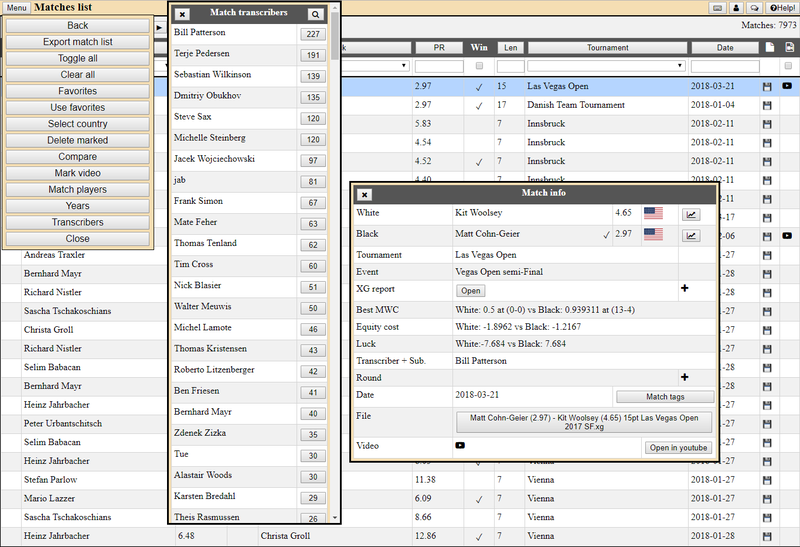 [*] Export match list from match list section and match transcription section. [*] You can now download past online matches for each day in my matches section. [*] Old home screen/menu options have been removed. The winner is the 'light' home screen with possibility for layout customisation and dialog menu. 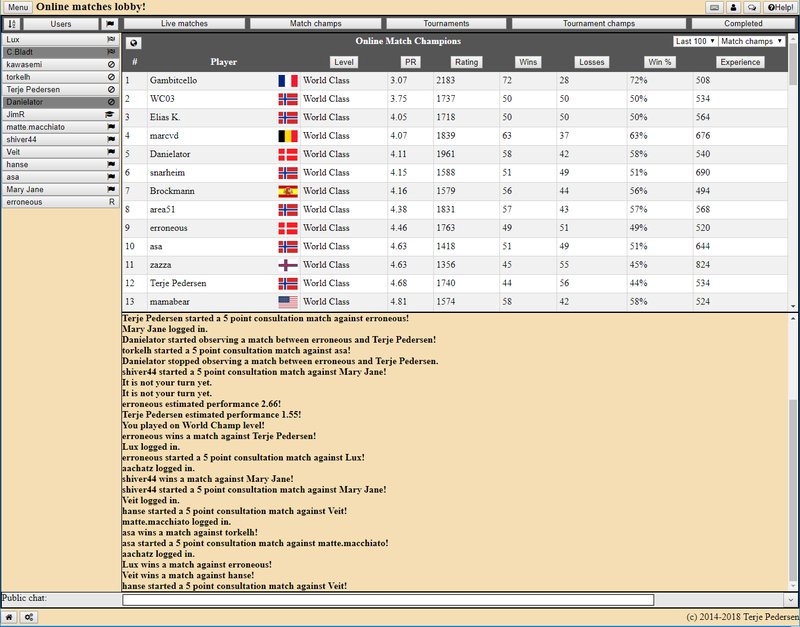 [*] Overview of matches for each year in match list section. [*]Head 2 head info on speed/dmp matches weren't displayed correctly. Reported by Geir Pedersen. [*]Fixed problem with match video and other dialogs opening up behind it instead of in front of it. [*]Fixed a problem with disconnecting players if not responding within 3 seconds. [*]Interest icon wasn't refreshed properly for new users. [*]Dialogs could sometimes show up below other dialogs. [*]Opponent left message after match went missing. [*]Average PR value in my matches section didn't match lobby and my PR graph section. Reported by creamydave and others. [*]Static board numbers didn't get stored. Reported by Ercument Karatas. [*]The board could sometimes not show up when playing online match. The problem was a double login so messages could get sent to the wrong device. [*]A couple of bugs with playing through a match when not logged in. Login dialog must have a close button and chat shouldn't be displayed. [*]Reset settings didn't reset color settings. [*]Android reported some bogus window dimensions to the app when rotating device causing bogus portrait/landscape mode. [*]Play-as on small screens didn't work so well. 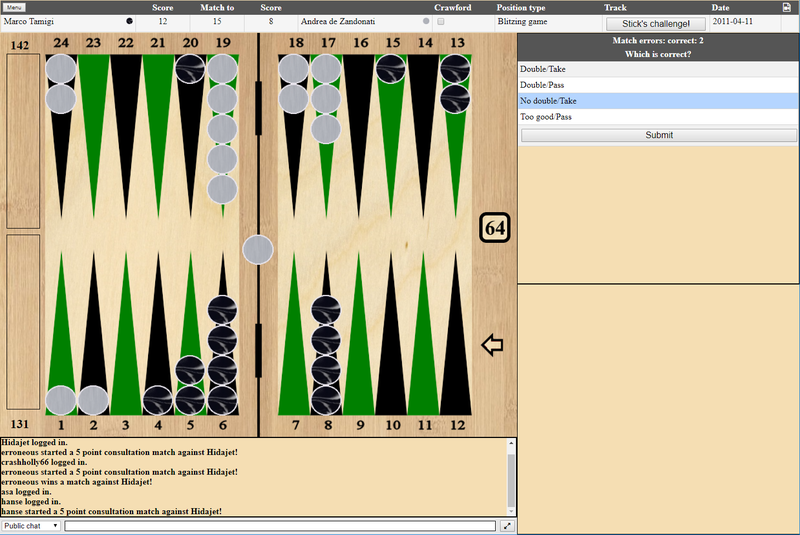 [url=https://www.backgammonstudio.com]Backgammon Studio[/url] The Swiss Army knife of backgammon!